Our first day was a long one, considering that it started at dawn on Wednesday in Broomfield and ended on Thursday evening in Tokyo—and the sun never set for us all that time. 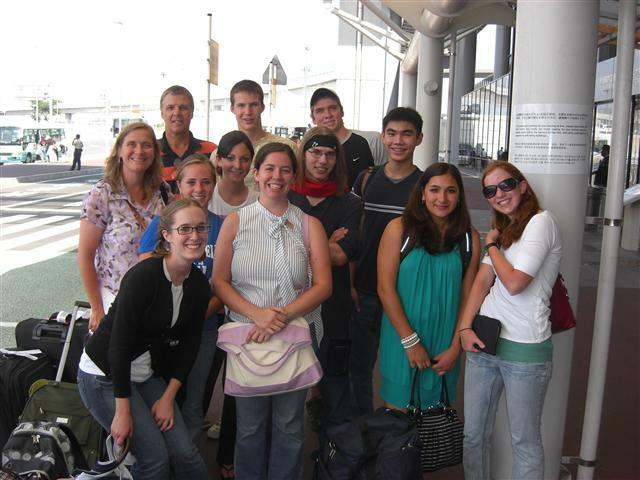 United Airlines held us on the ground in Denver for 45 minutes beyond our scheduled departure time, which made our transfer in San Francisco very challenging. The same flight from Denver also had travelers to Singapore and Beijing, so a gate agent assisted all of us during the transfer in San Francisco. We made the flight, but during the transfer the gate agent said, "Do not stop to shop!" We didn't, but many of us—well, me—wished we had time to get some food before the flight. With all the airline cutbacks, even meals on the international fights have suffered. And our flight to Japan was no exception. We departed from San Francisco, and flew up the coast toward Alaska. After drinks, a meal, and a film, many of us nodded off. The airplane's window shades were drawn tight, since the sun hung outside our windows during our flight. Hiro Nishimura, a former Broomfielder who has returned to his native country, met us at Narita, and shepherded us onto the bus from the airport to the hotel. Then, while we were getting settled into our hotel rooms, he bought our train tickets for our trip to Ueda. As people helped our bus depart from the airport, and as we arrived and departed from another hotel on the way to ours, they would give our driver crisp signals. When these helpers were done with us, they would bow deeply and send us onward. Even the folks at the desk of the hotel bow to greet guests who arrive or stop to ask questions. Interesting. Hiro also facilitated our first dinner at a local restaurant—Japanese, of course. Conversation among the group was surprisingly lively, though it faded severely by the end of the meal. Some of us had only a few hours sleep in the preceding twenty-four hours. We—well, some of us—enjoyed the tempura and sashimi. Everyone tried the raw squid and octopus. Nothing was left on the plates that were collected at meal's end. Our hotel, the Prince Shinegawa, is quite nice. In any major city, a room like this is pricey. I don't know what the rack rate is, but our rooms are all on the 33rd floor. The rooms are "cozy." Not much bigger than a standard bedroom in our American homes. Still, in addition to our twin beds, we have a desk without a desk chair and a sofa that looks as though it was in the dryer for too long. The bathroom is an interesting experience. The toilet is very high tech, and only this morning—thankfully—did we figure out how to get it to work. 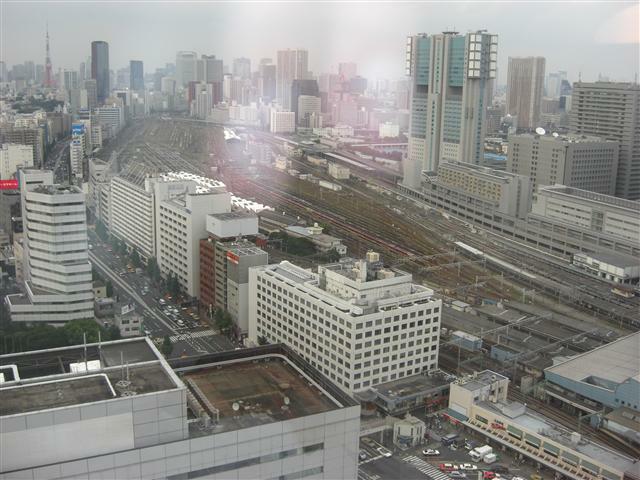 We overlook Shinegawa train station—one of Tokyo’s largest. The trains below appear to be part of the most fantastic model railroad ever constructed. And they run constantly. But the best of the view occurs at night when the Tokyo Tower, Japan's equivalent of the Eiffel Tower, lights up. High rises are plentiful—like those in New York City, but without the order that comes with streets planned within the last 200 years. For example, you’ll not see a canyon view as you do down Park Avenue in New York City. And unlike New York, there is very little city noise. Only one siren during the night woke me up. That may also have been because I was so sleep deprived. We all fell into bed around 8PM, Tokyo time. The skyline was ablaze with buildings all lit up. A law must require high rises to have red lights blinking atop them. From our rooms, we see the tops of the buildings compete with each other for attention, as their red lights blink at one another. Perhaps the winkling lights keep Godzilla from attacking. It's really something to see. On our first full day we will take a city tour that Hiro arranged. The Imperial Palace, home of Japanese royalty since the Meiji era and Tokyo Tower are on the list to see. When I was a young boy in living in Japan, we visited both places on school field trips. We may wind up at the Ginza, a famous shopping district, where I learned to use chopsticks decades ago.